The Plaintive Cuckoo (Cacomantis merulinus) is a widespread brood parasite in Asia, but no data on host species utilization in Bangladesh exist. By searching for nests of all possible host species of the Plaintive Cuckoo at Jahangirnagar university campus, north of Dhaka, we were able to determine which hosts were used in this area. We found that the Common Tailorbird (Orthotomus sutorius) was the only potential host used by Plaintive Cuckoos, and parasitism rate was rather high (31.3 %, n = 16). However, both host and cuckoo breeding success was poor (0 %, n = 16) due to frequent nest predation. Details on host and cuckoo egg appearance are provided. Our findings indicate that Common Tailorbirds are common hosts of the Plaintive Cuckoo in Central Bangladesh. Several avian brood parasites appear to be generalists at the species level, utilizing a range of host species. Such parasites, however, may consist of several host specific races (also called gentes), each utilizing one or a few host species (de Brooke and Davies 1988; Moksnes and Røskaft 1995; Davies 2000; Gibbs et al. 2000). Each gens has often evolved host-specific adaptations as a response to anti-parasite adaptions in their particular host, of which egg mimicry is one of the most prominent parasite adaptations (de Brooke and Davies 1988; Moksnes and Røskaft 1995; Davies 2000; Starling et al. 2006; Antonov et al. 2010; Fossøy et al. 2011, 2016). So far, most of the research on gentes-specific adaptations has involved studies on Common Cuckoos (Cuculus canorus), while our knowledge of the existence of such adaptations in many other members of the Cuculidae family is much more fragmentary (but see e.g. Starling et al. 2006; Spottiswoode 2010; Feeney et al. 2014). For poorly known brood parasites, the first key information is to provide background data on host use in various parts of their range. The Plaintive Cuckoo (Cacomantis merulinus) is an interspecific obligatory brood-parasitic bird, with a wide range in south and south-east Asia (Becking 1981; Yang et al. 2012). There are four recognized subspecies: C. m. merulinus in Philippines, Sulawesi and Borneo; C. m. querulus distributed from India and China through Bangladesh, Bhutan, Myanmar, Laos, Thailand, Vietnam and occasionally Nepal and Sri Lanka; C. m. threnodes in Malay-Peninsula and Sumatra; and C. m. lanceolatus in Java (Payne 2005; Erritzøe et al. 2012). There exists some information on host use and egg appearance of Plaintive Cuckoos in parts of their range, but in general adaptations to their parasitic lifestyle is poorly known. Baker (1942), however, reports that Plaintive Cuckoo chicks evict host eggs or young similarly to the Common Cuckoo. The Plaintive Cuckoo mostly parasitizes host species with domed nests with a narrow entrance (Erritzøe et al. 2012). The Common Tailorbird (Orthotomus sutorius) is a common host for the Plaintive Cuckoo (Payne 2005), with records from China and India (Baker 1942; Becking 1981; Payne 2005; Erritzøe et al. 2012; Yang et al. 2012, 2016). In south-western China, a few records have recently been obtained from other Orthotomus species (Huang et al. 2015). Some other hosts have been identified in the other parts of the cuckoo’s range, such as Grey-backed Tailorbird (Orthotomus derbianus) in the Philippines, different species of prinias (Prinia spp.) and Zitting Cisticola (Cisticola juncidis) in India, different species of tailorbirds and Eastern Crimson Sunbird (Aethopyga siparaja) in Java, Dark-necked Tailorbird (Orthotomus atrogularis) and Yellow-bellied Prinia (Prinia flaviventris) in Malay-Peninsula, and Grey-breasted Spiderhunter (Arachnothera modesta), Dark-necked Tailorbird, Common Iora (Aegithina tiphia) and Green Iora (A. viridissima) in Borneo (Baker 1942; Becking 1981; Payne 2005; Erritzøe et al. 2012; Yang et al. 2012). In India, three different types of Plaintive Cuckoo eggs have been found depending on host and locality (Becking 1981). In Ashy Prinia (Prinia socialis) nests, the cuckoo eggs are reported to be uniformly chestnut colored, sometimes with faint darker chestnut spots around the blunt end. In Plain Prinia (Prinia inornata) nests, the cuckoo eggs have pale blue ground color boldly marked with clear blotches and twisted lines of red, dark brown or purple and greyish underlying markings. The third type of cuckoo eggs have pinkish or bluish white ground color with reddish brown blotches and dots often forming a ring around the blunt end and found in Common and Olive-backed Tailorbird (Orthotomus sepium) and Zitting Cisticola nests (Becking 1981; Erritzøe et al. 2012; Yang et al. 2016). Hence, these observations from different parts of Asia indicate that the Plaintive Cuckoo may consist of host-specific tribes similar to the Common Cuckoo in Eurasia (de Brooke and Davies 1988; Moksnes and Røskaft 1995; Davies 2000; Antonov et al. 2010; Fossøy et al. 2011, 2016). The Plaintive Cuckoo is a resident bird in Bangladesh and there are many potential host species available, for example, Prinia spp. and Cisticola spp. (Grimmett et al. 1999). However, there are no previously confirmed records of parasitism from this area. Our aim was to disclose host species use by Plaintive Cuckoos in Central Bangladesh and discuss host use and basic egg characteristics in relation to findings in other areas. By doing so, we provide another piece of the puzzle to disclose the spatial variation in host use and parasite adaptations (here egg appearance), and set the stage for more thorough analyses of existence of host-specific gentes using e.g. DNA-analyses of eggs sampled in the field and stored at museums (see e.g. Gibbs et al. 2000; Fossøy et al. 2016). The study was conducted in Jahangirnagar university campus (23°52′N, 90°16′E), located 32 km north of Dhaka, the capital of Bangladesh during 2013. The study site comprises an area of 200 hectares and consists of diverse ecological habitats and vegetation (see Begum et al. 2011b). The campus area is well known locally for its large number of bird species, with 180 registered species of birds belonging to 43 families, out of which 74 species are recorded as breeding residents, 41 non-breeding residents and 65 migrants (Mohsanin and Khan 2009). Two cuckoo species, Asian Koel (Eudynamys scolopaceus) and Common Hawk Cuckoo (Hierococcyx varius) are common residents in the campus, while Indian Cuckoo (Cuculus micropterus), Jacobin Cuckoo (Clamator jacobinus) and Plaintive Cuckoo are summer visitors (Grimmett et al. 1999). Asian Koel uses House Crow (Corvus splendens), Common Myna (Acridotheres tristis) and Long-tailed Shrike (Lanius schach) as hosts whereas Indian Cuckoo exploits Black Drongos (Dicrurus macrocercus). Common Hawk Cuckoo and Jacobin Cuckoo use Jungle Babbler (Turdoides striata) as host (Begum et al. 2011a, b, 2012). All these cuckoo species occur in sympatry and coexist with their current hosts in diverse habitats in the study area. Plaintive Cuckoos have been recorded to visit Jahangirnagar university campus regularly during the summer months (March–August) (Mohsanin and Khan 2009). We therefore systematically searched the different habitats of the study area to locate nests of potential hosts of the Plaintive Cuckoo. All vegetation of the potential nest sites were explored almost daily during the breeding season. When a nest was found, details about the contents were noted, and the nest was then visited every day until predation/fledging. A total of sixteen Common Tailorbird nests were found, among which five nests (31.3 %) were parasitized by the Plaintive Cuckoo during April to July 2013. On 20 April 2013, we found the first parasitized nest while the latest was found on 29 June 2013 (Table 1). All the parasitized nests either contained a parasite egg (n = 3) or chick (n = 2) when first found. We found relatively few nests of other potential hosts; Common Iora (n = 3), Purple-rumped Sunbird (Leptocoma zeylonica) (n = 4) and Zitting Cisticola (n = 2; pers. obs. by S. Begum in 2009), but none of these nests were parasitized. Although Prinia spp. are regarded as potential hosts, they are uncommon in the study area, and no nests were found during the study period. The average tailorbird nest height was 1.06 (SD ±0.25, n = 16) meter above the ground and most nests were found in Ficus hispida. Only two other plant species were utilized as nest sites: Shegun (Tectona grandis) and Bhat (Clerodendrum viscosum). Four of the parasitized nests were found in Ficus hispida and one in Shegun. Host clutch size in non-parasitized nests was 2.82 (SD ±1.08, n = 11). The average size of Plaintive Cuckoo eggs was 19.72 mm × 13.62 mm (n = 3). In all cases, the Plaintive Cuckoo egg was elongated, with glossy light blue ground color and brown blotches. The blotches formed a ring at the blunt end of the egg (Fig. 1). 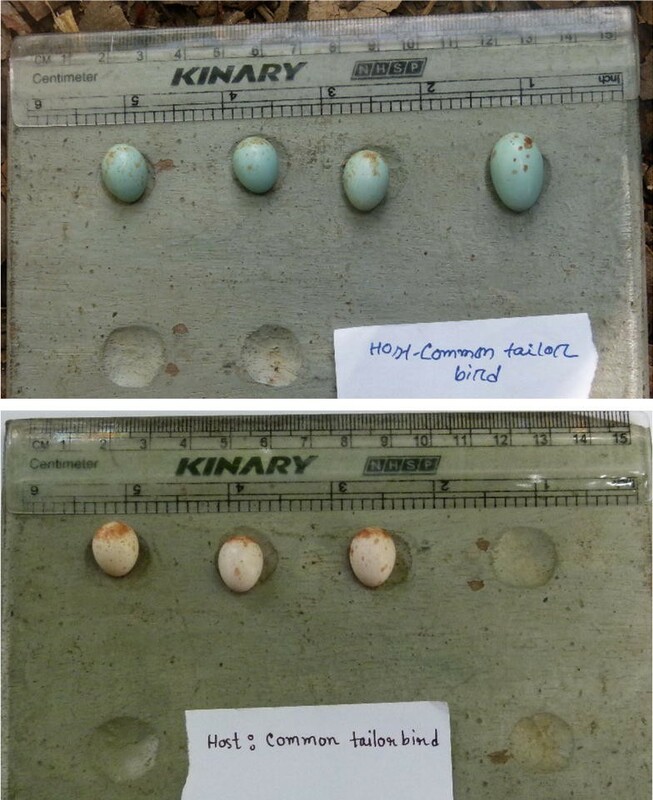 The egg color of Common Tailorbirds varied between two different morphs among different clutches in our study area. One type was blue with brown spots, while the other was white with brown spots at the blunt end (Fig. 1). The proportion of blue and white egg types in the host population was 82.1 and 17.9 %, respectively. The Plaintive Cuckoo eggs were all highly mimetic to the former type as judged by the human eye. The young cuckoo chick was pale yellowish with pale yellow bill, and the skin and bill turned darker after a few days. There was a high nest predation rate, and in fact, none of the tailorbird or cuckoo nestlings fledged successfully (Table 1). In all the predated nests, we found either sewing of the leaf was fully open with nesting materials on the ground, or the whole nest including leaf was totally broken and fallen on the ground. In some predated nests (n = 2), broken egg shells were found on the ground. No direct observation of predation events were made, making identification of specific predators difficult. This study suggests that the Common Tailorbird is the main host for the Plaintive Cuckoo in the study area, even though sample sizes of other potential host nests were low. Tailorbirds are common in the study area and are distributed throughout the campus, whereas other potential hosts are neither common nor evenly distributed. This variation in host density may influence the Plaintive Cuckoo host selection (see e.g. Stokke et al. 2007). Parasitism rate of Common Tailorbirds in our study area (31.3 %) was higher than at a site in south-western China (17.0 %, Yang et al. 2016). Nest predation rates were extremely high in the area, probably due to high densities of reptilian, mammalian and avian predators that are all attracted to the campus area which serves as a wildlife refuge that stands out from the surrounding populated and agricultural areas. These characteristics of the study area may also explain the high parasitism rate observed. Even though no predators were observed in the act of predating nests in the present study, the most likely predators (based on their abundance in the area) are crows (Corvus spp. ), Rufous Treepie (Dendrocitta vagabunda) and Bengal Monitor Lizards (Varanus bengalensis) (pers. obs.). Squirrels and small rodents may also play an important role in nest predation (Pangau-Adam et al. 2006). The host clutch size in China was reported to be 4.2 eggs (SD ±0.7) (Yang et al. 2016), which is considerably larger than in our study area. In fact, several of the apparently complete clutches (containing the same amount of eggs on consecutive days) in the present study only contained one or two eggs, which may be due to partial predation. In one nest, there were three host eggs when first found, but two eggs disappeared at a later stage, while the nest with the final egg was later destroyed by predators. Due to potential partial predation, the parasitism rate reported in the present paper may also be an underestimate, because predators may have removed cuckoo eggs before we found the nests. The breeding season of Plaintive Cuckoos in our study area lasted from April to July, which is similar to other areas. In India, this species breeds from April to August with a distinct peak in July (Becking 1981), in Myanmar from April to July (Smythies 1986), in Thailand from April to August (Lekagul and Round 1991) and in Borneo from March to June (Sheldon et al. 2001; Payne 2005). Common Tailorbirds laid eggs of two main types, a white and a blue morph, both with brownish spots. The same two host egg morphs have also been found in western China (Yang et al. 2016). During the study, cuckoo eggs were only found in host clutches containing the blue egg morph. However, we cannot exclude that cuckoos have laid blue eggs also in host nests with white eggs and that the host have rejected unmatched (i.e. non-mimetic) eggs before we first observed the nest. In China, the Plaintive Cuckoo laid eggs randomly without matching their own egg morph, whereas the tailorbird distinguished between different egg colors and rejected unmatched eggs (Yang et al. 2016). The proportion of blue host eggs by far exceeded the proportion of white eggs in our population. The proportion of the different host egg morphs may play an important role in the evolution of different cuckoo egg morphs (Yang et al. 2015). In China the proportion of blue and white host eggs was 50.6 and 49.4 %, respectively, and the Plaintive Cuckoo laid two different egg morphs that were both highly mimetic to host eggs (Yang et al. 2016). The Plaintive Cuckoo egg size in our study area was more or less similar to the cuckoo egg size in several other areas. In China the cuckoo egg size was 18.3 mm × 13.5 mm (Yang et al. 2012), in India 19.1 mm × 13.3 mm (Becking 1981), and in Java 20 mm × 14 mm (Payne 2005). In two out of three cases where nests contained a cuckoo chick, the parasite was alone in the nest. In the last nests, there were three host eggs and one cuckoo egg when first found, but finally only one cuckoo and one host chick. These data support the statement by Baker (1942) that Plaintive Cuckoo chicks evict host eggs and chicks, although not always successfully so. MIN, FF, SB, ER, and BGS designed the study and drafted the manuscript. MIN and SB collected the data. All authors read and approved the final manuscript. We are grateful to Yousuf, Monoronjon and Rony for their tremendous help with fieldwork, and to two anonymous referees for insightful comments that improved the quality of the manuscript. The study was supported by a grant through ‘Quota Scheme’ at Norwegian University of Science and Technology (NTNU). The present study followed all the ethical laws of Bangladesh and there was no injury to any birds in this study.